The area of product liability is considered one of the largest risks for a repair shop, FBO, or parts manufacture. The strict tort liability imposed by the legal system means that regardless of wrongdoing, the repair shop, FBO, or parts manufacture may be named in a suit alleging liability for bodily injury, or property damage resulting from a repair, or a product which has been sold. Airport: two airplane mechanics discuss paperwork for a small plane in a hangar. Repair shops can be small operations with a few employees who work on airplanes, helicopters, or parts of an aircraft. Normally these shops return aircraft to service using the A&P license of the mechanic who performed the work. 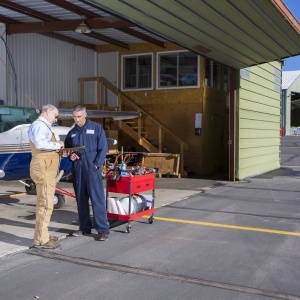 Larger repair shops generally are operated under the FAA regulation CFR 14, part 145 and are referred to as aircraft repair stations. These companies are often manufacture approved aircraft, and engine maintenance facilities. Work performed at these repair stations are approved and returned to service using the Repair station number assigned by the FAA. Any company performing maintenance on an aircraft, or providing a part used on an aircraft, assumes significant liability. To protect the company and the mechanics who perform the work, an aircraft products and completed operations liability insurance policy should be part of a comprehensive insurance plan. An aircraft products and completed operations liability policy is intended to provide a defense (even if the suit is groundless) and judgment coverage if the repair shop is determined to be legally liable for all or part of the occurrence. Aircraft maintenance companies should in addition to having an Aircraft Products and Completed Operations Liability insurance policy, carry additional coverages to protect themselves against a potential claim. Ground hangarkeepers legal liability insurance is coverage for a whole aircraft, or parts removed from a whole aircraft, that are in the care and custody of the repair facility. If operating or running the aircraft engine is necessary for maintenance purposes, coverage for this operation can generally be added to the ground hangarkeepers legal liability insurance coverage under the policy. In-flight hangarkeepers is a non-owned aircraft policy. This coverage protects the insured for their legal liability in the event of a loss, or damage while in flight to non-owned aircraft that is in the care or custody of the repair facility. 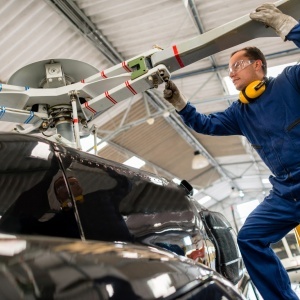 This coverage should be part of a comprehensive insurance plan if the repair facility is doing any form of testing, or maintenance flights in a client’s airplane, or helicopter, or providing pick-up and delivery services of the aircraft. Policy form differs with each carrier, but generally helicopters are considered to be in flight when the rotors are in motion do to the helicopter being started. AvQuest Insurance Service provides insurance to many different types of aircraft maintenance companies. One of our licensed, experienced representatives would be happy to review your company’s operation to assure that you are properly protected.